Personal, corporate or custom images on clothing, caps and outerwear. Offering machine embroidery designs, lace and cross stitch machine embroidery, delivered by e-mail. Providers of hospital scrubs and uniforms, chefs apparel, and general purpose clothing, all with custom embroidery options. Includes products, online shopping, and contact information. A selection of sewing, quilting, and embroidery supplies. General sewing notions and outdoor fabrics. Henna and mehendi artistry supplies, ethnic embroidery, temari balls, and ethnic music. Also features a temporary adornment image gallery area, troubleshooting section, and general information and instructions. Sewing and embroidery machine sales and classes. Sewing machine auctions. FAQ sewing and embroidery. Free embroidery downloads provided and updated regularly. Embroidery, silk screening, monogramming and computerized lettering. Unique embroidery from Bulgaria. All designs are hand-stitched. Offers blank machine embroidery design cards. Offers software for creation of home embroidery designs automatically. Computerized machine embroidery for your business image. Offers stabilizers for home embroidery machines. Embroidery on paper, kits and patterns. Templates are available in printed and electronic format. Provides quality screenart and embroidery services. Sells embroidery software for home and commercial machines. Also free downloads. Offers supplies, products, tools, and accessories for embroidery, dolls, quilts, and sewing. Custom embroidery of your logo or stock design. Custom embroidery, heat applied graphics (transfers), jackets, apparel, and CCM NHL hockey jerseys. Specializing in old fashioned hand-look machine embroidery designs. Madeira thread and embroidery supplies. Sewing patterns. Personalized embroidery gifts including baby items, blankets, towels, teddy bears, and apparel. Specialising in stumpwork embroidery, offering kits, materials, beads, threads and presentation boxes and bowls. Embroidery and silk screening service. Authorized seller of Singer and Brother sewing and embroidery machines. Free and discounted embroidery designs, digitizing software. Aprons and smocks, with custom embroidery and monograms available. Also has a small selection of kitchen linens with optional embroidery. Needlepoint canvas and yarn, cross stitch leaflets and charts, embroidery kits. Supplies for silk ribbon embroidery. Offers book featuring letters of Major General Lafayette McLaws. One of the oldest operating general stores in Ohio. Offers the tranquillity of an Amish oriented town that has changed very little over nearly two centuries. If the business hours of Sarahs Embroidery in may vary on holidays like Valentine’s Day, Washington’s Birthday, St. Patrick’s Day, Easter, Easter eve and Mother’s day. We display standard opening hours and price ranges in our profile site. We recommend to check out sarahsembroidery.com/ for further information. 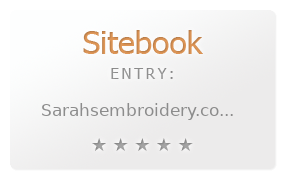 You can also search for Alternatives for sarahsembroidery.com/ on our Review Site Sitebook.org All trademarks are the property of their respective owners. If we should delete this entry, please send us a short E-Mail.